Do you know where you will be one month from today? We do! And we are thrilled to ask you to join us! 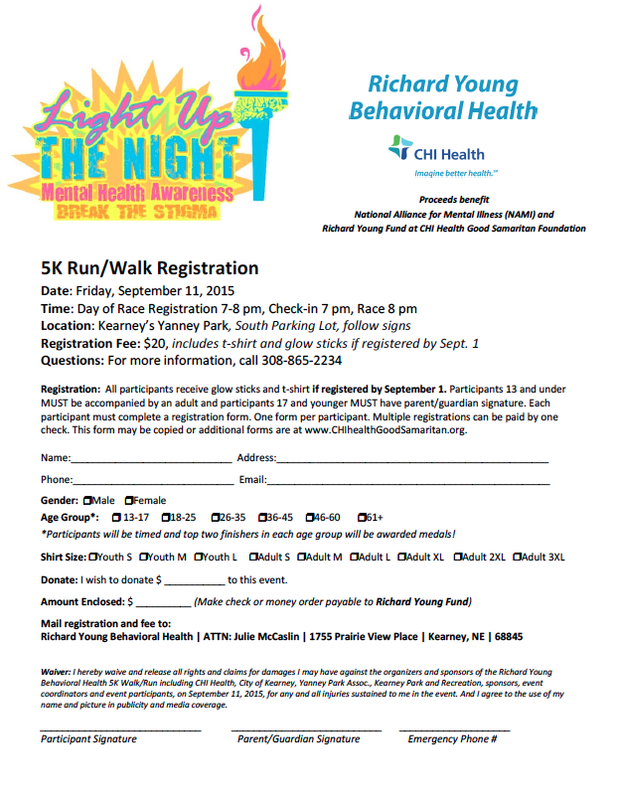 We will be lighting up the night for the mental health awareness 5K walk/run on Friday, September 11th at Yanney Park in Kearney, Nebraska with registration beginning at 7:00 and the race beginning at 8:00. The walk is put on by Richard Young Behavioral Health (CHI Health). Proceeds will go to the National Alliance for Mental Illness (NAMI) and Richard Young Fund at CHI Health Good Samaritan Foundation. Feel free to save this image and send in for your registration! This race comes six years to the day from the terrifying moment I first walked into Richard Young Hospital with my husband who had nearly attempted suicide earlier that day. September 11, 2009 was the first day of our journey toward hope, healing, and acceptance of our reality. Jeremy has survived because of God and the good that He placed in our lives. Richard Young Hospital is part of that good. We have talked about it before in great detail and we will continue to work hard to help anyone suffering from an unseen illness or supporting someone suffering to get to our book. “Never Alone: A Husband and Wife’s Journey with Depression and Faith” is our life, and there is no sugar coating our reality. The book is now available in both eBook and paperback format. You can purchase either here on our website using the “Purchase” tab. We wrote our true life story detailing Jeremy’s struggles with a severe depression diagnosis, five suicide attempts, and a near-death accident likely caused by a medication failure in order to help society understand the reality of depression. We wrote it to help those suffering from suicidal thoughts or other forms of depression understand that it is okay to ask for help; in fact, it only makes you stronger. We wrote it to help you understand that mental illness is real and those suffering should never be made to feel ashamed. We wrote it to help those supporting someone suffering understand that mental illness affects many, not just the person with the diagnosis. We wrote it especially to help everyone find the hope we found in Christ. Healing can happen with the acceptance of the reality that is mental illness, with the acceptance of help from the good God has placed in all of our lives (like mental health professionals, friends, and family), and with the belief that healing can come when we put our faith in God. We choose every day to fight mental illness. Jeremy takes his medications faithfully, visits his mental health doctors and therapists regularly, and openly expresses his reality to me, his primary support person. It is a conscious decision to live. It is a desire to provide hope to those who may be suffering like we did or attempting to support a loved one struggling. There is hope, but you have to choose to fight the illness. In order to fight, we must break the stigma attached to mental illness. Awareness is key because those suffering deserve good care, support, and the hope of healing. “Never Alone: A Husband and Wife’s Journey with Depression and Faith” is now available in both eBook and paperback format. You can purchase either here on our website using the “Purchase” tab. Thank you for supporting us as we share and helping us help others. God bless you all. ← This Just In…And Today God Gave Me What I Needed!! !